M.J. (Michael James) Heney (1864-1910) was a railroad contractor of international renown, best known for constructing the first two railroads built on The White Pass and Yukon Route. The son of Irish immigrants, Heney rose to the top of his profession and his life inspired several books and at least one movie. Michael James Heney was born on October 24, 1864, near Stonecliffe Ontario, son of Thomas Eugene Heney and Mary Ann McCourt, Irish immigrants who farmed in the upper Ottawa valley. At age 14, Heney ran away from home to work on the Canadian Pacific Railroad (CPR). He was found and brought home until until 1882, when he left home to work on the CPR in Manitoba. He started as a mule skinner and gradually worked his way up through all the aspects of construction. At 21, Heney was ready to set up as an independent contractor. He returned east to earn the engineering degree his father wanted him to have, but was too impatient and was soon back in the west. Many construction projects in Washington, British Columbia and Alaska followed. When the Klondike gold rush came, Heney was ready. 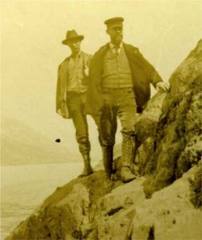 He visited the Skagway area to survey potential routes to the interior. 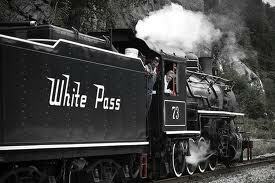 By chance, he met London financiers also looking to build through the White Pass. A deal was struck and Heney was hired, first as labor foreman and then as contractor. Built through wilderness, far from supplies, using labor that was itching to leave for the gold fields, the 110 mile line was an outstanding achievement and gained Heney an international reputation. At the pinnacle of his career, Heney was returning north from Seattle when his ship hit an uncharted rock and sank. Heney lead the rescue operations, but there was no room in the last boat, so he held on to the stern while it was rowed ashore. He developed pulmonary tuberculosis as a result and died a year later. Widely popular, Heney was known as "Big Mike" or "The Irish Prince of The Iron Rails".